Recently, a client of mine brought me the variable annuity he bought a few years ago. as well as the fact that the money will earn an fixed annualized rate of 5.75%. Under the bold ACCOUNT FEE subtitle, it states: Account fee is $35 per contract year. 1. The fixed interest rate of 5.75% only applies for the first month, after that, it will be 1.75% . 3. The death benefit charge is 1.9%. 4. The rider charge is between 0.75% and 1.5%. 5. The living benefit costs 0.75% initially, but there is no cap on how high it can go. 6. The underlying fund expense is between 0.3% and 1.75%. 7. The surrender charge is 8% for the first three years. In his wildest nightmare, my client did not imagine the total cost would be more than 2%. In actuality, it is 6% and up. These charges are not disclosed in one places, they are scattered in different pages of the contract. No wonder my client did not find them. Most people hate to read insurance contracts: there is a confusing array of terminology and legal jargons that would make a lawyer blush. Also they think the government is watching anyway, so why bother. What they don’t know is: annuity and life insurance products are not under the purview of the SEC. They are private contracts between you and the insurance companies. Since insurance companies write the contracts you don’t read, guess who will come out ahead? My advice: read before you sign. If you’d rather read Sports Illustrated, at least hire a fee-only financial advisor to read it for you. Why fee-only? They are not taking money from the insurance companies; chances are they will give unbiased advice. If you have already purchased an annuity or life insurance contract, it still behooves you to understand the true costs and benefits of the contract. My 2nd Opinion Financial Review service will help you do that. 27 Responses to "Variable Annuity Fees You Don’t Know You are Paying"
About the guarantees insurance cos provide, I have another post where the guarantee is only 64% of the premium value. If the insurance cos can’t even deliver that, they can always go bankrupt or get another tax payer bailout. You continue to hit the nail on the head with these missives. I found this one to be especially well written and effective. Nice job! I’m all for putting numbers out there so people know and understand the truth but your numbers are so off they don’t come close to making sense. The death benefit number looked really high (my mother has a contract with a competing company) so I checked the Lincoln’s website and other sources and it is .25%, not 1.9% and their max M&E charge is 1.65%, not 2.4% so please read carefully and do research before you post incorrect numbers on your site. With two Masters you should be able to figure this out. Maybe you could put what you read on the site so we could see the actual numbers? First of all, I’d like to thank you for being skeptical. If most investors are like you, they won’t be taken for a ride by the insurance companies and agents. Did I not read it correctly that the max M&E is 2.45%? Please enlighten. David…I await your response. I have bookmarked this page and I hope you will respond! You sir have done nothing but demonstrate your ignorance by double counting and misrepresenting fees. You obviously have an agenda and it certainly is not an agenda that is aimed at the truth. Please be specific, where am I double counting and misrepresenting. My agenda is very simple: ordinary investors should avoid complicated financial products; if they have to, at least read and understand the whole contract. You have a problem with that? You refer to VA’s not being regulated by the SEC. This is true. They are regulated by FINRA. They are also regulated by each of the 50 States. Before they can be sold in a state that state scrutinizes them very carefully during the approval process. That process often takes 6 months to a year. As far as costs are concerned, ask many investors who bought one of these in mid summer 2007 how glad they are to have had the guaranteed accumulation and withdrawal guarantees. They would probably feel that the charges were well worth it. 1. FINRA is a company (FINRA, Inc.), not a government regulatory agency, so it can not regulate the industry in any legal sense. In fact, FINRA has a membership list made up of other companies that sell annuities, stocks, and insurance. See http://www.finra.org/AboutFINRA/MemberFirms/ListOfMembers/P012908 I would call that “setting the fox to guard the hen house”. Good for the fox, not so good for the hens. 2. As far as the states regulating the insurance industry, well, each state has its own set of laws. Some are comprehensive, so less so, and some are downright inadequate. This is the same reason why so many large financial services companies have headquarters in certain states (Connecticut, Delaware, and South Dakota come to mind). The laws in those states are so “business-friendly” that consumers should be ready to … well, bring their own protection. In any case, pitting a small under-staffed underpaid insurance commissioner’s office vs. a high priced legal squadron from a multi-billion dollar insurance company is not a fair fight. 3. Your last paragraph is the most telling, to me. Your comment is not about how consumers have _done_, but how they _feel_. Finance is not about feelings, much though financial companies spend millions on conveying that warm and fuzzy feeling in their commercials. Finance is about numbers. My numbers show that I made money in my stocks from 2007 until today. I kept my money in low cost Vanguard funds, kept investing (new money and re-invested dividends), and re-balanced when needed. This is the same thing that insurance company fund managers do, but without the wood-paneled offices, fancy suits, bonuses, and 6%+ costs. Here is my challenge, if Michael Zhuang is willing to act as referee. I am willing to send my spreadsheets of my investments from 2007 through 2011 to Mr. Zhaung. You send the same data for your high priced annuity, or better yet, to avoid cherry-picking, send the whole range of annuity data for your whole company’s portfolio that you sell. (I assume you’re a salesman from the way you write.) We’ll see who did better, you with your high costs and “guarantees”, or me. Thanks for the answer. I am more than willing to be the referee. Thank you for the post. I just went through my elderly father’s variable annuity and other investments his financial advisor bought him and am disgusted. People have no idea how bad they are being taken advantage of by their trusted advisor. I now have to take the time to break down the fees and search through the prospectus to show him why it is a terrible investment. Once more his advisor had spoken with him recently because the end of the surrender period is approaching and he told him it’s a 4 year investment and he needs to get into something else. Are their laws that could hold him accountable for clearly breaking his fiduciary duty? 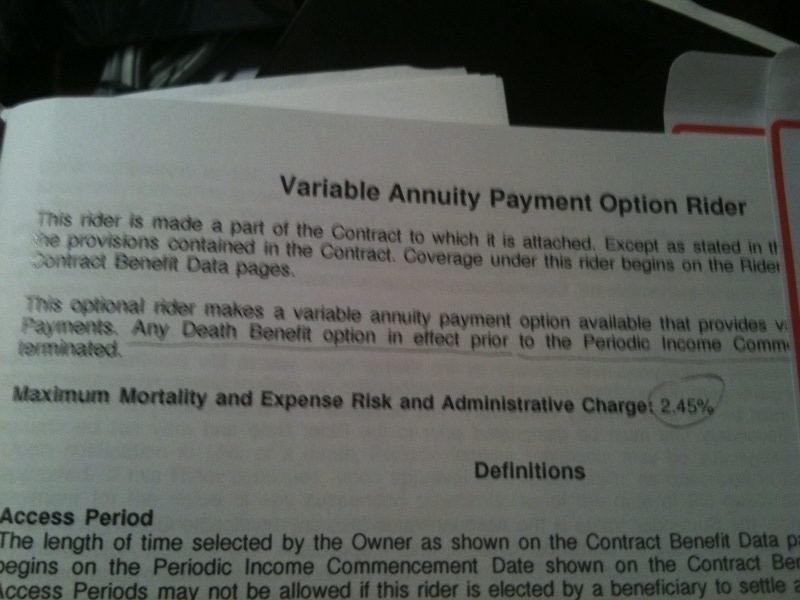 Conveniently in the fine print his annuity started the day before the surrender fees were lowered. I appreciate your post as well! It has been tough for me to convince my loved ones to fire their sketchy financial advisors and purchase low cost index funds or Berkshire Hathaway. I just sent out 10 copies of John Bogle’s book “The little book of common sense investing” in hopes that it is short and straight forward enough to have an impact. I’m not a very good salesman (even though I’m not selling anything and just trying to get them to realize the better way to invest passively)…if only I could recruit one of these annuity sales people to actually do good and give sound financial advise (something tells me that won’t happen). Anyway any advice on straightforward material I can direct my family and friends to would be much appreciated. You are doing all the right things. The financial industry is spending billions of dollar brainwashing people. It takes a lot of work to undo the damage. I have an email newsletter that I send out monthly. A little education every month may lead to changed behavior. You may want to sign up for those people you care about. What do you think about the Vanguard Variable Annuity? This is my opinion, not a personalized advice. I trust Vanguard, they will not have layers upon layers of hidden fees. But still you have to consider carefully whether VA is right for you: with VA, you save on capital gain taxes and will end up paying income taxes which are at a higher rate. Jerry: I know this all comes from a good place of being a consumer advocate and I am for that but FINRA is a quasi-government entity called an SRO. They are larger than the SEC and together they regulate the securities industry. They might even become the regulator for the fee-only RIA segment of the business (which right now is only regulated by the states and the SEC). Google it and check it out. However, nothing is really “approved” by FINRA, SEC, or the states (in fact it is illegal to say that). They are just determining whether or not they are fair for the public. Michael, I like your blog but are you against Variable Annuities? Is fee-only planning the only way to go? What if you work with an honest independent fee-based advisor that gives you all of the options and is completely transparent about the fees and the entire process? I feel strongly the fee-only model because I believe once a financial advisor takes commissions, his or her advice will be tainted no matter how well-intented he or she maybe. I know my weakness, I don’t want to be in a constant struggle about doing good for my clients and getting a fatter commissions. I highly recommend you take the fee-only route as well. With regard to annuities. My view of annuities is that they are a longevity hedge product, they are not the most efficient saving and investment vehicles that many fee-based advisors (aka insurance agents) make them to be. A person in his 70s and at risk of outliving his saving, I would recommend an immediate annuity to him. 1. They are sold as a great investment products to people in the 40s and 50s who do not yet have longevity risk. 2. Those that are heavily sold happens to command the highest commissions. 3. There many charges and fees associated with the product. 4. The contracts are easily 100 page long, very hard to read, very easy to hide fees. My my client was paying as high as 4.51% in annual recurring charges for this “investment” product. You tell me whether that makes sense for him. I could easily contract a similar portfolio with Vanguard funds for as little as 0.2% expense ratio. Annuity® A Fidelity Tax-Deferred Variable Annuity”? We’re considering investing due to the low annual fee and the tax-deferred feature. 1. The 0.25% is just the annuity charge, there is an expense ratio on the mutual fund level. 2. When you take out money from the annuity, you will pay income tax on the gains as opposed to the lower capital gain tax. Michael, our financial representative is recommending we go into the Lincoln Lifetime Income Advantage 2.0 protected Funds–5% guaranteed income per year. Our ages are 76 and 75. Would you mind giving me a comment? I can’t give you my opinion without reading the actual contract, but from my past experience reading these types of contracts, I am very skeptical that they don’t high a catch or two somewhere. Anything that an insurance agent pitch to you, you can be sure the commission for him is high and the profit for the insurance company is high as well. With very little understanding at the time of what was going on, I purchased a variable annuity from Protective Life/Lincoln National Life through an Edward Jones agent. The amount invested was $7500. Now I realize that the fees are very high and will continually increase in actual dollars each year. I have recently moved all of my retirement investments to low cost Vanguard index funds. Should I now cash out this annuity or at least transfer it a Vanguard fixed annuity and pay the 6% surrender free, since it only $450 right now but would be more later as the balance increases? It’s good you learned a lesson and now are using Vanguard. It continues to amaze me how low is the so-called “suitability standard” brokers have to abide by. I suppose it is considered suitable, as long as the annuity does not cause food poisoning.